Kitchen Fitters in DERBY, DE21 7PH. Covering Coalville, Derby, Heanor, Ilkeston, Loughborough, Radford, Nottingham and surrounding areas. Welcome to BBK Interiors in Nottingham. We have been established in the Nottingham area for over 9 years, and have over 17 years of experience in interior design. We can provide you with installations for kitchens and bathrooms, and renovations for bedrooms. These include the plumbing, gas safety and all of those little things that make your life comfortable. Our services are available throughout Coalville, Derby, Heanor, Ilkeston, Loughborough, Radford, Nottingham and surrounding areas. Our aim is to be available every step of the way, from supplying the quote and planning out your room to the installation and the finishing touches. We can provide you with expert advice on all aspects of the work planned, and help you to decide what you want, how you want it and where you want it. We will provide you with a 12 month guarantee for all of our work, and are more than willing to check back in during that time to make sure that everything is still working. Our sub-contractors are Part P registered electricians and Gas Safe registered gas installers. Please visit our website for further comprehensive information on how we can help you. We can provide other services not listed above. "Absolutely amazing. BBK interiors fitted 2 new bathrooms for me over 2 weeks. One the main family bathroom the other the en suite. From the first meeting with them for a quote, their communication via email prior to work commencing, their quality of work and to the last day of work I was extremely satisfied. The bathrooms look amazing and have been completed to the highest quality. No minor detail has been missed and nothing was too much trouble for them. I would definitely use them again and recommend to a friend." "I would highly recommend BBK interiors. 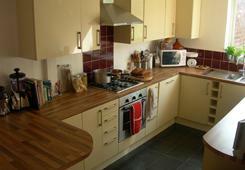 We had a new kitchen fitted and room modernised. Jon was very professional, friendly and helpful through out the whole process. Very happy with the final result. Thanks Jon, Shaun and Kathy"
"Absolutely fantastic tradesman and company, John and Shaun are very professional. They carried out the work at a very high standard, they went above and beyond to get a large job done in a small amount of space and time. They are incredibly easy to get along with, we will definitely be recommending them to anyone and we are definitely using them again on any future projects we have. Thank you very much for the work done. 10/10"
"BBK are very experienced with bathroom fittings and helpful during the planning stages. Work carried out on time and left clean and tidy each day. Very pleased with the whole bathroom, particularly the modern shower and toilet John suggested. Would definitely use again"